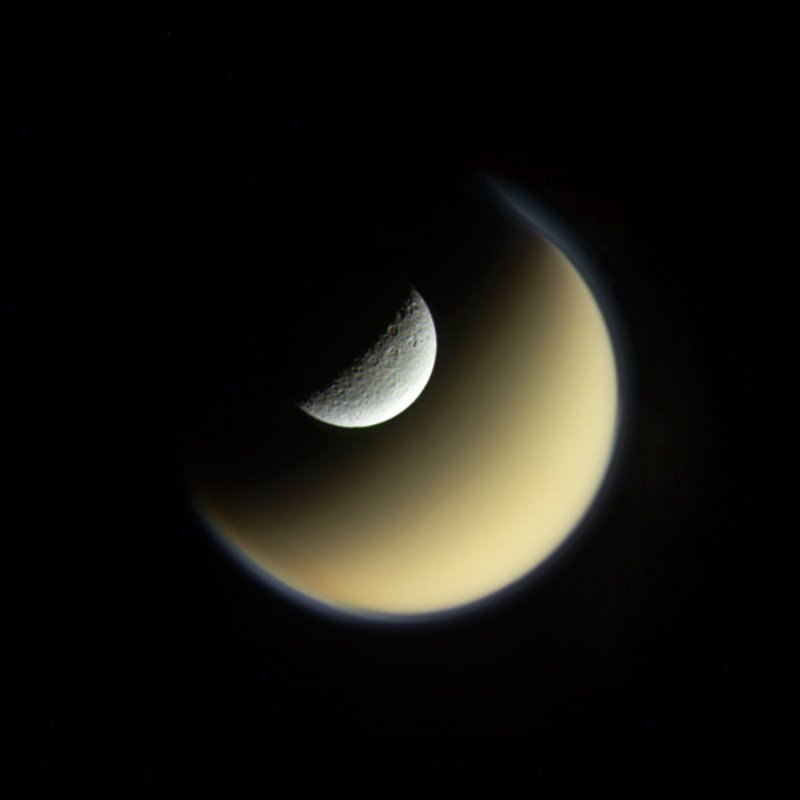 Here’s a color-composite image of Rhea and Titan, Saturn’s largest moons. Made from raw images acquired by the Cassini spacecraft on June 16, 2011, this really shows the vast difference in size and appearance of the two moons. Rhea, seen in the foreground, is an icy, airless and heavily-cratered world 950 miles wide. Titan, on the other hand, is over three times larger at 3,200 miles across and covered in a thick atmosphere of methane and hydrocarbons. 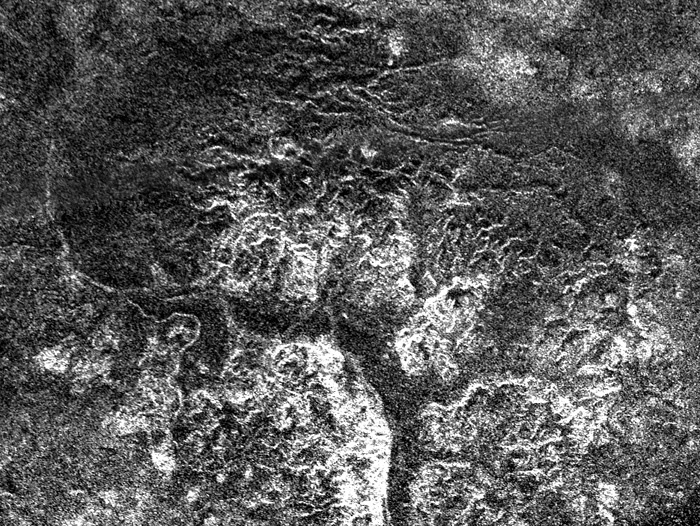 Its surface features mountains and valleys, with lakes and streams of liquid methane… and it may even have a liquid subsurface ocean. Raw images taken in red, green and blue visible-light channels were combined to make this color version. The spacecraft was 1,828,949 km (1,136,456 miles) from Rhea when the images were taken. Credit: NASA / JPL / Space Science Institute. Edited by Jason Major. I can’t resist pointing out that you have “north” pointing downward, though. It’s hard to tell these days which way north is on Titan, but a good clue is that weird sliver of blue haze extending above the south pole. That and the northern polar haze layer still haze a distinct look (although it appears to be fading). Cassini actually seems to be taking most images the “other way” around than it used to for years, my guess is with the equinox passing the spacecraft was rotated 180 deg for thermal reasons. Or something. Thanks Gordan. I was wondering that myself but I couldn’t tell the difference. Is there someplace (besides looking at it) that tells Cassini’s orientation during image acquisition? If it’s an observation I can’t make out which way north should be, I go to http://space.jpl.nasa.gov and plug in Cassini and the target, play around with observation time and see what it churns out, it always rotates the image to make the target north vector up. Only works for the major moons as the Solar System Simulator doesn’t include the small rocks, unfortunately. Cassini Viewer has all the moons, but it’s harder to use than SSS where you just click in numbers and hours.